So I’m at this birthday party held for me at a nice Italian restaurant and there are eight of us and we all have a salad course that includes a sliced beets garnish. No one likes beets and I'm eating everybody’s. I’m incredulous that no one appreciates beets so I decide to prepare beets in a way that all would appreciate. If the notion of eating beets makes you sad, get ready for a happy upgrade. There is a wonderful way to enjoy this very healthy vegetable which is so rich in folate, manganese and fiber. If you think you don't like beets – think again. You could like beets; but not the way they are usually prepared. Forget those horrible canned, bland beets and roast up some fresh ones. When you do, you'll be a beet-lover. As their intense colour indicates, beets are big-time antioxidant providers and also have cancer and heart- disease fighting properties, as well as a host of vitamins and minerals. Nutritious beets are inexpensive; they store well; and they’re available throughout the year. But forget about the numerous health benefits these ruby-coloured gems bestow. Roasting the beets magically brings out an extraordinary flavour that you can savour with an all over warm pleasant taste. Beets done this way will tickle your innards. Roasted beets could become as popular as baked Idaho potatoes, or okay, at least an occasional culinary diversion. Roasted beets pair blissfully with greens, cheese and nuts. If you haven’t eaten beets in awhile, or never; please try this dish and excite your taste buds. A zesty, vibrant salad of greens, cheese and nuts that features roasted beets. I know - your mouth is already watering, so I’ll stop talking now and let you go ahead and enjoy. Heat oven to 350F/175C. Wash and scrub the beets thoroughly. Leave the skins on. Put the oiled beets in a baking dish just large enough to hold them. Check that they are tender. Depending on their size they may need a couple more minutes. Remove from oven and let the beets cool slightly. Meanwhile, whisk together vinegar, mustard, honey, and garlic in a small bowl. Slowly whisk in the oil and season with salt and pepper. Set this vinaigrette aside. After beets have cooled enough to handle, remove and discard skins and cut into bite-size pieces. 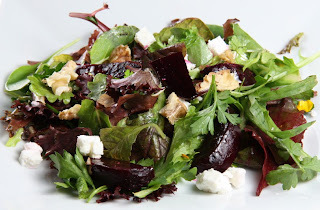 Mix beets with half of the vinaigrette, then mix spinach and watercress or radicchio with the rest of the vinaigrette. Transfer greens to plates and top with the beets, walnuts, and gorgonzola cheese. Add the peaches and/or orange segments. Your recipe is heavenly. I love beets, even straight from the can, go figure! Your opening sentence really caught my eye because my birthday is today, 10-22, and I'm celebrating with a 3-fold promo! Getting older just got a whole lot more fun for me! Our Russian friends taught us how to make a gorgeous Russian soup they call "borcht", and the star ingredient is beetroot. It is fried with vinegar before being boiled with the rest of the soup and it tastes great! Beet salad is one of my favorites! Will definitely give your recipe a try! The salad looks great, but I can't stomach beets. I know they're good for me and I have tried, but I just can't do it! I may try them in a smoothie though. Perhaps if I don't have to chew them I'll be OK. In any event, I'll try the salad sans the beets! :-) Thanks Anthony! TORVIEWTORONTO: I agree. Beets are a great vegetable. GAIL BAUGNIET: Aloha.I like them straight from the can too,as well as harvard beets. But this treatment is really wonderful. Hope you had a great birthday and may you get a bestseller as a gift. Aloha. DUNCAN D HORNE: I've had borscht and I like it too. However, my favourite way with beets is this roasted method.I met a russian emigre from Moscow in a giant vegetable market in Atlanta, Ga who has been juicing for 15 years. I saw plenty beets in his basket. I see beet consumption as minimal, at least around here and I would like to see it change. You and the girls take care Duncan. JOYCE: You will enjoy this I promise. Happy to hear from you. CHATON: So it's the "chewing" on them that irks you, eh? Okay, how about roasted carrots? Anyway, thanks for calling, I hope you and the family are well. Best wishes. I need to try this, beets are my daughter favorite. love it. SWATHI IYER: Beets should be mo re popular, this recipe could turn it around. Your daughter has good taste Just thinking of the roasted beets is exciting my taste buds. I've never been a beet person but my mom is I will have to share with her. Thanks!! ALEXIS AKA MOM: Let your mom try this and if you like the aroma perhaps you could just taste a small spoonful. You never know, you just might like it. I love beets. This salad is right up my alley. So glad to hear this, I am looking for beet-lovers. You qualify. Wow Sounds super healthy and Yummy at the same time! Must Try! Okay, I have to try this! I am not a beet lover, but I know I could be. I think this recipe will do the trick. I'm going to print it tomorrow (Zane is sleeping near me right now--don't want to wake the kiddo). I fixed beets for dinner earlier today. :) But we do have more . . . might just try out this recipe! I'd be eating everyones' beets, too! 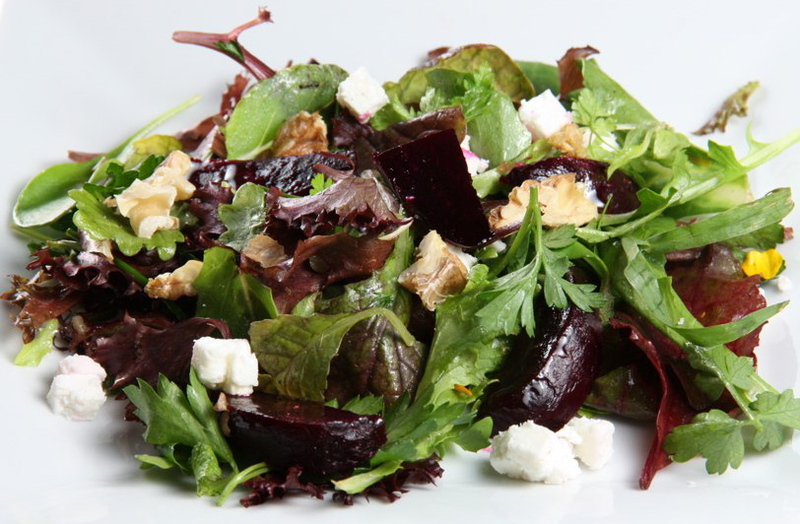 Your salad sounds divine...beets taste so good with blue cheese and walnuts! What a lovely fall salad! LYNN PROCTER: Dreams are weird, I usually don't recall having one or maybe a tiny bit which doesn't make sense (although during the dream it made perfect sense). I love canned beets, very easy to make tangy Harvard Beets with them. Even my spouse likes the roasted beets. CURT IFFERT: It is all that Curt, thanks for calling. SUSAN OLOIER: This beet treatment will win you over, and the beauty of it is that you have one more small bit of vegetable variety. If Zane was that close you should have kissed him atop his head, I would have. COOKING VARIETIES: I am happy that you like this recipe, I think it could change the minds of a lot of beetphobics. THE GOLDEN EAGLE: You can roast the beets this method to just serve with whatever dinner you are preparing. I know you will love roasted beets and want to try this salad. Thanks for visiting. LIZZY DO: We are in total agreement, I am glad to hear from you. JOANNE: Yes indeed, please make this soon, your guests will love it. When I was a kid, I hated beets, which I'd only had from a can. But as an adult, I've had them fresh after being boiled, and what a difference! I've never made them roasted. I must try it. CQUEK: That's true, some countries, like India, have a vast amount of variety. THERESA MILSTEIN: I always liked beets, even from a can but roasted they are really good. Healthy and colorful salad. Looks delicious. VARDHINI: Thanks, I appreciate that. looks yummy and mouthwateringly delicious! Oh my gosh! I ate this the other day! But I had feta instead of Gorgonzola. Yum! LYNDA R YOUNG: Feta's good. I guess I can definately put you down as a beetaphile. Everyone with good taste seems to enjoy this dish, except I have a couple of in-laws who still have not tried it yet; but I can't be everywhere. Thank You for your comment, it made me feel good. Best wishes. SUSAN FLETT SWIDERSKI: Susan, finding those rye triscuits was really wonderful, although not all supermarkets have it. For variety I used to get those black pepper triscuits but the rye are my favourite. I owe it all to you, so take a bow and hip hip hooray. Love your salad- looks refreshing! Oh man, I love beets! But, I am in a beet-resistant family. Hah, they don't know what they are missing! I will give this salad a try. Thanks! MALLI: I agree with you, beets are under-appreciated. Thank you for calling; your Malabar shrimp curry is excellent by the way,the carrot adds a nice touch.